The latest game from Epic and People Can Fly is here, and it sets the new standard for fun. Right from the start you can see that this game was never trying to be realistic like Call of Duty. It is what games should be; fun. To be honest, fun is an understatement. It is insane. Brutal, crude and hilarious. 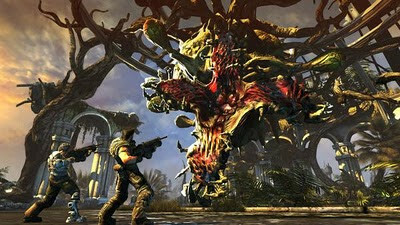 Bulletstorm tells the story of Grayson Hunt and Ishi Sato trying to escape the resort planet, Stygia. For Hunt though, it is also the revenge mission to end all revenge missions. Ten years earlier, Hunt the leader of a gang of mercenaries. He and his gang completed hundreds of missions for General Sarrano, murdering thousands of people who turned out to be innocent, not the murderers and drug dealers that Sarrano claimed they were. 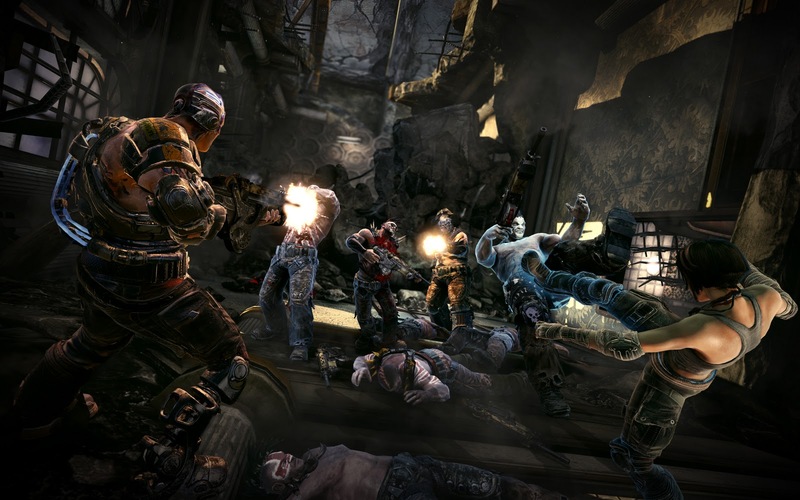 The game takes place on a world full of mutant prisoners, and thousands of them stand between you and your target. The world is seriously beautiful. Incredible vistas are not uncommon in Bulletstorm, and offer some relaxation and rest from the imaginative killing. The unique selling point of Bulletstorm is the skillshot system. You get points for killing in creative and new ways, which can upgrade and unlock new weapons. This system would literally not work on any other FPS, as it heavily utilises the leash and the ability to kick objects and enemies. It can only truly make sense by playing the game, but it is amazing. An early example, so as to not give away any kill spoilers, is to pull an enemy towards you with the leash, and then kick their midair body into spikes. There are so many kills that use only the leash and kick, that you could progress through a lot of the game without using some of the most mind-blowing weapons in gaming history. You start with a basic PMC, an assault rifle but soon enough you will gain access to super powerful shotguns, flare guns and bouncing bombs. And that's just a few, more incredible ones await. Each weapon had a special charge shot, which give the already awesome weapons some amazing special features. The PMC charge shot unleashes a hundred bullets in one deadly shot, instantly turning the enemy into a skeleton. The charge shot for the pistol is a flare, which ignites the target and surrounding enemies, before exploding. The graphics on the world are near perfect, but on the characters they are let down ever so slightly. The textures on the characters don't seem to be utilising the Unreal engine as much as they could, but it's not a big problem. The fun vastly outweighs the slight issues, and you rarely have time to focus on the characters with all the insane action going on 99% of the time. Taking down standard enemies is so much fun, the boss fights are jaw dropping, the world is beautiful and the script is hilarious, full of the most creative insults ever made. This game is a must have, despite the short campaign and disappointing boss fight. It takes away some of the seriousness we are used to, whilst still having lots of emotion and heart. You need to play this game.